1. 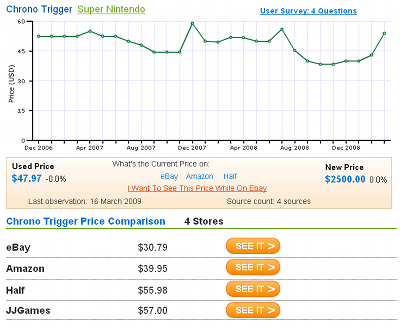 Added Price Comparison Section: A section that lists the prices for each location was added. This should make it easier to know which site has the best prices. Keep in mind that all of these sites sell items quickly so the prices we list might not be the exact price you find after clicking the "See It" image. 2. Removed Advertisement: The advertisement on the right side of the page has been removed. 3. Removed Similar Games: The "Similar Games" section was removed. Our tests on the site showed most customers never used these links. They were removed to add information that users find more relevant. 4. 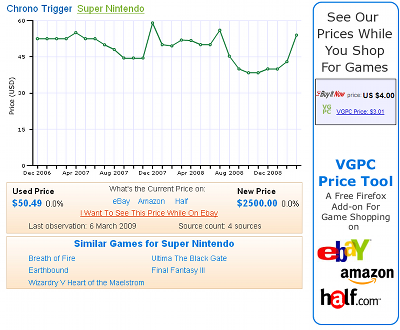 Bigger Chart: The chart showing historic prices is now wider and takes up more space on the page. Below is the new layout vs the old layout for Chrono Trigger so you can see the difference. We made the changes we did because the majority of users told us they used the game pages to either comparison shop or to see historic prices. Please let us know what you think of new layout by taking a brief four question survey. Some users might still see the old page because we are still running a few more tests. Please be patient while we finalize the changes. Everyone should see the final changes soon. I love the new layout. It brings much more attention to the chart and the prices, the two major things that I come here for. Good work on the change.